This hoppy session Pale Ale uses a blend of PNW hops, including Mosaic, Equinox and Glacier, for a pungent blend of peach, mango and tropical aromas. This hop-forward session American Pale Ale uses a blend of classic and modern Pacific Northwest hops, including Mosaic, Ekuanot™ (formerly Equinox) and Glacier, for a pungent blend of peach, mango and tropical aromas. 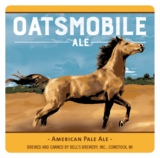 The signature ingredient – oats – are what makes Oatsmobile Ale stand apart, and gives it a body that you don’t see in most other sessionable pale ales.